I wrote another "poem" at 5am, you know, because drinking a Monster energy drink last night was a good idea. This one's a little God themed, but let it be known how I don't plot these, think about them, or even have an idea about what I am going to shove together on a magnetic surface until I sit in front of my sad, 20 year old mini-fridge. So maybe it's about God. Or maybe it's not. Who knows? 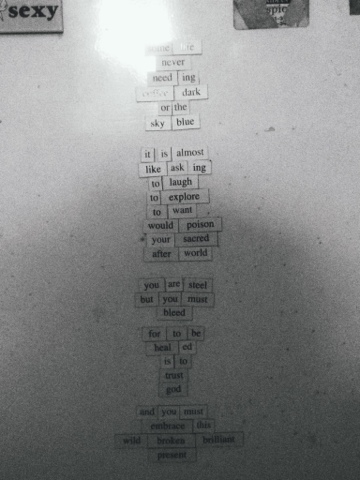 It's just magnetic poetry, yo!